Luton trialist Calvin Zola came off the bench to spectacularly sink Championship side Brentford 2-1 on Tuesday and maintain Town’s unbeaten pre-season campaign. The Hatters only had two good goalscoring opportunities and they took them both with Luke Wilkinson giving them the lead late in the first half. The Bees quickly levelled through Philip Hoffman on the stroke of half time but then could not not find another way past the exemplary Elliot Justham in between the home posts. The goalkeeper pulled off a string of saves to deny the west Londoners, with the standout stop from former Hatter Andre Gray, who burst through one-on-one just two minutes after his introduction in the second half. 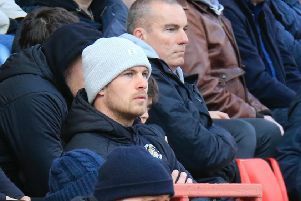 The friendly was the result of the striker moving from Luton to Griffin Park last summer, but his former fans saw more of him in the stands as he watched some of the first half from the Oak Road end. Also absent from Luton’s starting line-up was free agent Craig Mackail-Smith, though he too watched the game from stands, fuelling hope that the sought-after striker will still sign for the club. The hosts made eight changes to the side that drew with League One Coventry on Saturday with Stephen O’Donnell, Steve McNulty and Nathan Doyle keeping their places and the former two part of a back four – including Wilkinson and Scott Griffiths – that impressed, given a full 90 minutes. Another Town trialist, Mustapha Tiryaki, started the game but couldn’t stretch enough to connect with Josh McQuoid’s whipped-in cross early on. O’Donnell forced Bees keeper Jack Bonham into a routine save soon after but the visitors largely kept them at bay. Stuart Dallas was the first to find Justham in the right place at the right time, but that was a routine stop, compared to his next two. Ryan Williams had his head in his hands after the custodian spectacularly pushed his free-kick around the post and then Nico Yennaris saw his dipping drive get the fingertip treatment too. At the other end Bonham had little hope of emulating his opposite number when, from a Luke Guttridge corner, Wilkinson rose highest and thumped a header into the top corner. But the defender barely had time to refocus on the game when he saw Hoffman get the better off him to steer in Andy Gogia’s cross on just before the interval. Town boss John Still waited until the hour mark to make his changes with Zola one of four home introductions. The forrmer Stevenage striker’s first contribution was to clatter into replacement keeper Mark Smith but his next trick would be far more damaging. But first, Justham earned himself the man of the match gong, beginning with a double save to deny Gogia and Hoffman and then with his pièce de résistance to thwart Gray. Luton had barely threatened at the other end, but in the 78th minute Zola changed that in an instant when he turned and rifled into the bottom corner of the net from 20 yards to sting the Bees.